Of all the competing voices out there, how do you know which one is right? Which one is worth listening to? And which ones carry more weight than the others? Who you listen to and why is a major theme of the letter of 1 John. John wrote this letter teach his readers to recognize the difference between the true gospel and false gospels and between true teachers and false teachers. John wrote his gospel shortly before around 85 AD. John wrote this letter around 90 AD. John was one of the 12 apostles who heard the gospel directly from Jesus and were given a special calling to proclaim that they heard. Further, he was one of the inner circle, or one of those closest to Jesus. John most likely wrote this letter from Ephesus when he was an old man. John was the last surviving apostle and one of the last of the generation that was an eye-witness to the earthly life and ministry of Jesus Christ. Heresies and false teachers are beginning to run rampant in the young church as the next generation begins hearing the gospel from others; “sons” hearing it from the “fathers”; not from apostles or from those sent by apostles. Most likely this letter was most likely not sent to a single church; rather it was intended to be sent to many churches. A church would receive the letter, make its own copy and send the original to another church; the new church would make their own copy and send it on to another group, and the process kept repeating. Jesus is not the Messiah and he never said he was the Messiah. 1 John 1:1 begins with 4 relative clauses that give John’s credentials to settle the debate of who do you listen to: You listen to the apostles. The clauses move from abstract to tangible. “What was from the beginning” – this message came directly from Jesus himself. It is the original, genuine gospel. As an apostle, John offers authoritative, conclusive, tangible verifiable proof that the this gospel is the way to gain eternal life. John uses 2 different verbs for “see” (Strong’s G3708) and “look” (Strong’s G2300) to convey the idea of “behold intelligently” or “see and grasp the meaning of”. “Word of Life” = the message of life or the revelation of life. In other words this is what we heard from the beginning of Jesus’ ministry about the way to obtain Life. For a definition of Life, see What is life and death? 1John 1:2 begins a parenthesis explaining how the message was revealed. “Testify” indicates authority of experience. “Proclaim” is an authority of commission. The source of the message and the commission is Christ. In 1 John 1:3-4, John says that we (apostles) proclaim what we saw and heard from Jesus so that you might believe and be saved. The goal or the end of the proclamation is fellowship and joy. In this letter, John teaches how to recognize truth by its substance and by its source. It’s substance is grace, the free, unmerited favor of God because of the death and resurrection of Jesus Christ the Messiah. It’s source is divine revelation from God. The true gospel is the gospel preached by Jesus and those he selected and specifically commissioned to continue teaching and writing his message, his apostles. For more detail and explanation, please listen to the podcast. 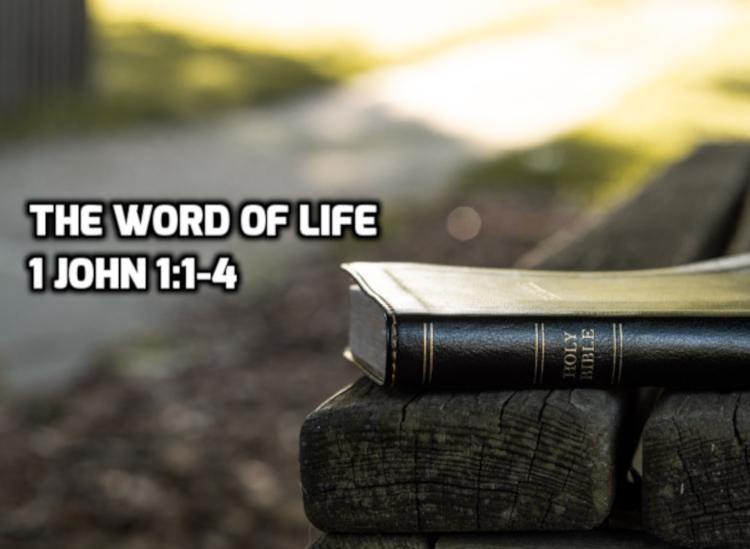 What is the Word of Life?